Map Puzzle is a free portable program for Windows to download maps from Google, Bing and several other public mapping services. While you can open several public mapping services at all times if the device you are using is connected to the Internet, you sometimes may want map data to be available offline. Maybe because you are traveling to a foreign country and don't have Internet there right away or at all, or maybe you are somewhere where Internet reception is bad, or not available at all. Downloading may also come in handy to avoid bandwidth charges, or having to wait until the data becomes available. Map Puzzle is a feature packed portable maps downloader for Windows. Since it is portable, you may run it from any location including a removable drive or disc. The main program interface may look intimidating at first, as it is packed with features and options, but you will get the hang of it quickly. First thing you need to do is set a base mapping provider, and if you want, an alternative base mapping provider as well. From there, you may enter coordinates directly, or enter the name and country of a place to have Map Puzzle look up the information for you. If successful, latitude and longitude are entered automatically. Those are the only changes that you are required to make. You can theoretically hit download right away to download a map of that area. You may however want to check out the image settings first, as they determine how much of an area gets downloaded, and how far you are zoomed in, or out of it. The default area is set to 2560 pixels in width and in height, and the default zoom factor of 17 means that each pixel covers an area of 2.38 kilometers. The largest zoom level is 25 and it means that each pixel shows a couple of meters on the downloaded map (if you keep the default width and height). You may modify the pixel size, or the zoom level to change the area that Map Puzzle will download once you hit the download button. The program supports presets, A4, A5, Fanfold and dozens more that you may select. This can be useful if you want to print the map, and want to make sure it fits on whatever you want to print it on. 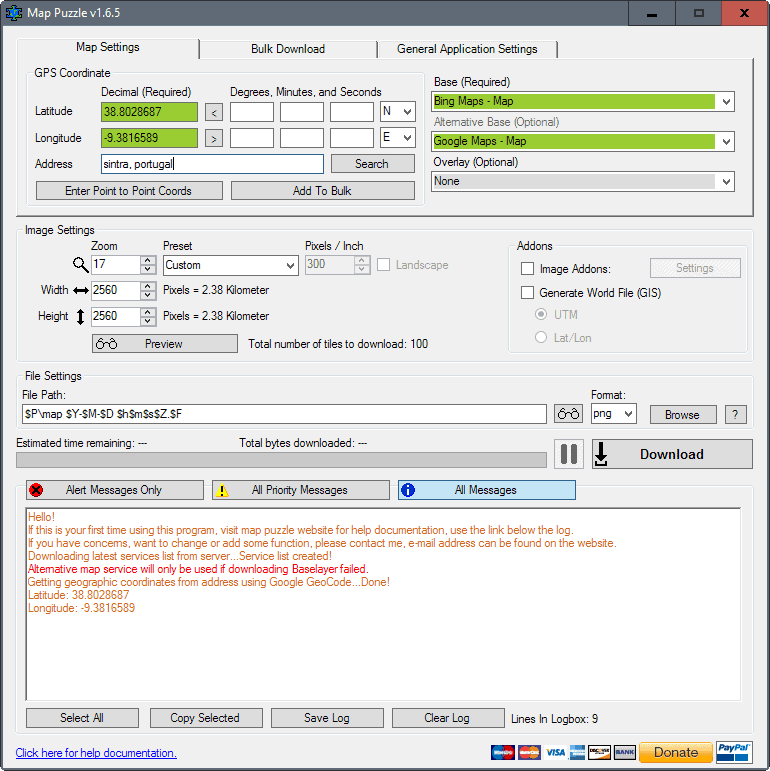 The preview button is useful in this regard as well, as it shows the area that the program will download as a preview. The options that Map Puzzle provides don't end there though. You may add an overlay to the map on top of all that. 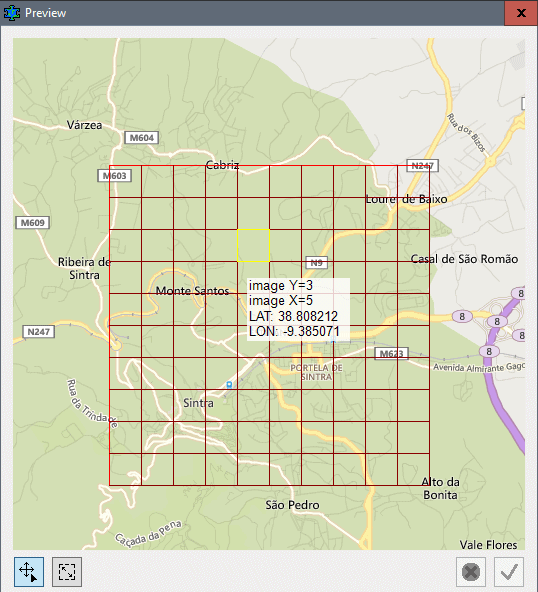 Overlays include the Google Bike map, or hiking or cycling routes of other map providers. You may also enable image addons, and the generation of a World File (GIS). Last but not least, you may select a different output format for the map (png is the default), and run all operations in bulk mode by adding multiple places of interest to the program. Map Puzzle is a superb free program for Microsoft Windows devices. While you can use other programs for downloading maps, its feature set and ease of use makes it one of the prime programs for that task on Windows. There’s no download location on this website: the download button leads to a change log only. browse to the very bottom. the download link is there. Klaas you need to scroll down on the change log page. The download button is at the very bottom on that page. The program is clean. What you see is a false positive. If you check on Virustotal, you will find that only 2 of 61 engines detect something while all others don’t, and those two detect a false positive. I’m pleasantly surprised how fast the map result is downloaded. For some map sources I found it useful to view them in IrfanView for auto color correction, and zooming the result. According to VirusTotal the file is infected. I get a report of a “W32/S-accb32a8!Eldorado” from Cyren & F-Prot. While on that original map, you navigated and zoomed in to exactly the view you wanted, so why not just make a screenshot of it there, and save you the hocus-pocus to get a corresponding view out of this one … ? Map Puzzle is using google geocode and therefor you will not find a better street name to coordinates converter. I get no options in service chooser.